Jesus Christ will come silently, and gradually, when the world ready for Him? Comes and appears on television or in different locations? Christ will come personally and visibly in the heavens. According to the Bible as he left to come and see him every man. Comes as Lord of lords and King of kings. Everyone clearly understands that he is the Creator of the world and the ruler of the universe. No one can doubt, since his arrival as lightning lights up the whole sky from one end to another. 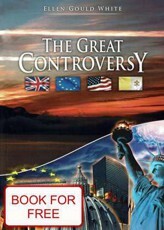 The earth trembles, the graves open and from which rises as the first true people of God. Jesus Christ has come and with it, people expected the resurrection to new life, or punishment. Coming of Jesus Christ is not something progressive, or secret, but quite shocking for everyone. The Bible says that everyone will see Him, even those who pierced him. Everyone is in awe before Him bow. People who love Jesus Christ, were filled with His love and respect his right by law to be filled with joy and happiness that will finally see their beloved King and Redeemer. People who have not accepted Jesus Christ into your heart and with it the cleansing from his sins will be filled with horror, sadness of wasted chances. Our Creator in us voluntarily underwent a severe and ignominious death for our sins so that we can be cleansed and go back to God the Father. Take him into your heart with gratitude and love. Expect happy to His second coming to liberate us from sin and suffering. His sacrifice for us, Jesus Christ has already laid, now comes as a winner and King of heaven with great glory. Acts 1,9-11 - After that, he was taken before their eyes upward and vanished from their eyes in a cloud. While intently watching him go to heaven, behold, there came to them, two men in white robes and told them: "What do you stand gazing at the sky, Galileans? This Jesus, who was taken from you into heaven, will return just as you saw him go. " Revelation 1,7 - Behold, it comes with clouds and every eye shall see him, even those who pierced him. All the tribes of the earth for him to cry. Yes, amen. Luke 17.24 - Like lightning lights up the landscape from one end of the sky to the other, so will the Son of man in his day. Matthew 24,30-31 - then the sky will appear the sign of the Son of man, and then shall all the tribes of the earth weep and see the Son of man coming in the clouds of heaven with power and great glory. And he will send his angels with a loud trumpet, and they shall gather together his elect from the four cardinal points, from one end of heaven to the other. Mark 13.26 - then see the Son of man coming in clouds with great power and glory. Christ comes in his glory as Lord and King of the universe. Even can not imagine the beauty, clarity and dignity that Christ will surround. Something so amazing no one had ever seen. 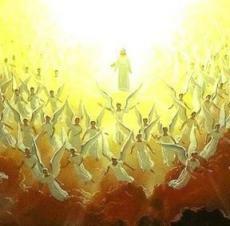 Matthew 25,31-32 - When the Son of man in his glory, all the angels with him, sits on his glorious throne. All nations will be gathered before him, and he shall separate them one from another as a shepherd separates the sheep from the goats. Psalm 50,3-4 - Here comes our God will not keep silent, before him as fire consumes everything around him severe storms! Convened down from above the heavens and the earth, the people that stood trial. 1 Thessalonians 4.16 - You will hear a rousing command, the voice of the archangel and the trump of God, the Lord himself shall descend from heaven and the first time the dead in Christ shall rise. 1 Thessalonians 5,1-3 - The times and days you do not need to write anything, my brothers. Yourselves know well that the Lord's day will come like a thief in the night. When people would say: "Peace! Security "is suddenly surprised doom, as if the pain will come pregnant, and will not leak. Matthew 24,37-39 - but as the days of Noah, so shall also the coming of the Son of man. As in the days before the flood they were eating and drinking, marrying and giving in marriage until the day Noah entered the ark, and noticed nothing until the flood came and swept away all, so it will be the coming of the Son of man. Jesus Christ also warned against imitation and falsification of His second coming and told his disciples that they have to be careful. Jesus warned that Satan would want to embody the angel of light. Will want to emulate the coming of Jesus Christ and bring the world united under his rule. Therefore, if you hear about the coming of the New Age that the Messiah will appear on television, or even that there is already alive and appears in different places, do not believe it. Virtue is no longer the word of Jesus Christ, who just before the mustering warned. Matthew 24,26-27 - says to you, 'Look, is in the desert! " do not go, or say: 'Behold, the secret place,' do not believe. Coming of the Son of Man comes like lightning - lit up the sky from east to west. Matthew 24,23-25 - If you had someone said, Behold, the Messiah is here! " or, 'There he is! " believe it. Rise is false messiahs and false prophets, and will do great wonders and miracles, so would bring (if possible) even the elect. Behold, I have told you beforehand. 2nd Corinthians 11.14 - and no wonder, for Satan himself pretends to be an angel of light! 2nd Thessalonians 2,3-4 - Let no man deceive in any way. Before that day comes, must come from God avert. Must appear that the wicked and reprobate, who will resist and exalt himself above everything that is said and what God is worshiped. Settle down even in God's temple and is called God! AmazingHope.net - How come Jesus Christ?